The National Bonsai Foundation is driven by a passion for bonsai and the Museum. We're preserving a history, protecting a legacy, and preparing a future. Founded in 1982, the National Bonsai Foundation is a 501 (c) (3) nonprofit that works in cooperation with the U.S. National Arboretum to supply financial, programmatic and curatorial support for the National Bonsai & Penjing Museum. The Foundation offices and Museum are located on the grounds of the Arboretum in Northeast Washington, DC. This private/public collaboration between the Foundation and the Arboretum enables the Museum to promote the art of bonsai and penjing to visitors through masterpiece displays and educational programs while also fostering intercultural friendship and understanding. In 1976, the people of Japan gave the gift of bonsai to the citizens of the United States in honor of their Bicentennial. These bonsai were the first to form the Museum. From the very beginning there was widespread support from the bonsai community for this incredible gift. In 1972 the American Bonsai Society, a national organization, and Bonsai Clubs International, a world-wide organization, endorsed the project. Once the trees arrived in Washington, DC, the Potomac Bonsai Association, an umbrella organization for Bonsai Clubs in the Washington D.C. area, provided volunteers to work with the staff of the U.S. National Arboretum in order to keep the trees in outstanding display condition. Group moves bonsai from Glenn Dale, MD to arboretum in 1976. Three of these volunteers that we owe special gratitude to are: Ruth Lamanna, Janet Lanman and David Garvin, who played significant roles in the development of both the Museum and the National Bonsai Foundation (NBF). In 1979, Janet Lanman discussed with Dr. John Creech, Director of the Arboretum, the possibility of acquiring American bonsai for the Museum. Shortly thereafter Dr. Creech pursued this idea in a proposal to Marion Gyllenswan, a well known bonsai teacher. He called for an independent body of bonsai authorities to review private bonsai collections of distinction and to develop a plan for their preservation, possibly as part of a national collection. Acting on this suggestion, a group of Arboretum volunteers and students of Bonsai Master Yuji Yoshimura organized the National Bonsai Committee: Marion Gyllenswan, Janet Lanman, Felix Laughlin, Muriel Leeds, Chase Rosade and Jerold Stowell, all of whom would be prominent in the founding of the National Bonsai Foundation. In 1982, the National Bonsai Committee was incorporated as the National Bonsai Foundation (NBF), a non-profit section 501 (c) (3) organization whose mission is to support the National Bonsai & Penjing Museum at the U.S. National Arboretum. NBF recruited directors from all sections of the country, and the first Board included Marybel Balendonck, Larry Ragle and Melba Tucker from California, Frederic Ballard from Pennsylvania and H. William Merritt of Maryland. MaryAnn Orlando served as the Executive Director and principal fund raiser for NBF. In 1986, on the occasion of the tenth anniversary of the Japanese Bicentennial gift, NBF held a Gala Celebration and set the agenda for the future. The main goal coming out of that celebration was to build an American Bonsai Pavilion to display a collection of North American Bonsai and to complement the Japanese Pavilion so that the similarities and differences in this ever-evolving art form could be studied and enjoyed. The dream envisioned in the Gala Celebration program became a reality in 1990. As part of the ongoing collaboration between the Arboretum and NBF a new section of the Museum was dedicated on October 1 of that year in honor of two American Bonsai Masters. The Yuji Yoshimura Educational Center is a classroom and work space area, and the John Y. Naka North American Pavilion provides the display area for the North American bonsai collection. The National Bonsai Foundation has had many milestones since its founding in 1982. See a full timeline of all of these important events by clicking the button below. 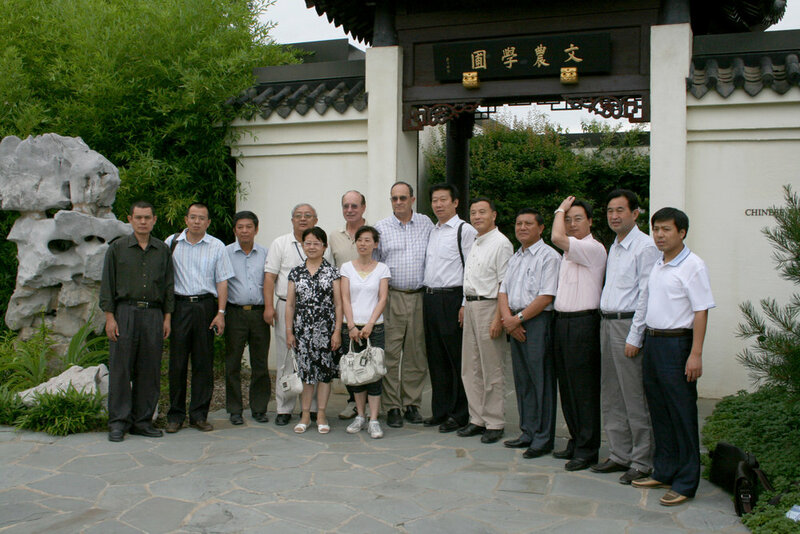 The National Bonsai Foundation exists because of the dedication of these fine people.